I'm a sucker for art history. I love some of the grandiose art movements of the past. One of my favorites is Rococo, which was prominent in 18th century France. I love the whimsical and flowing style and the strong use of pastel tones. Rococo art for lack of a better word was all very pretty, and pleasing to the eye. I was excited when Hare Polish released The Last Queen of France collection inspired by Marie Antoinette who was a part of this time period. I have Own Your Opulence to share with you today, a glitter topper that is highly representative of the Rococo opulent style and color scheme. Own Your Opulence is a mix of pastel glitters, black glitters, gold glitters, gunmetal glitters, and a gold shimmer in a clear base. Color: This is an amazing color combination, and in entirely unique to anything I own. I love the mix of black and gold with pastel, it is so luxurious, and so Rococo! I'm geeking out a bit. Love! Formula: Good formula! I used 2 coats in the swatch above. Price: This is $10.00 on Hare Polish's etsy site. Overall: I absolutely 100% adore this. I know it's partially the theme that I adore, but the polish is great! I love the inspiration. I think it represents the theme excellently and is truly a unique glitter topper in the indie world. 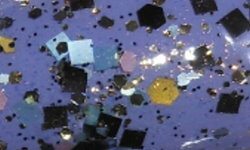 What a great mix of glitters in this polish! I love it too and it looks fantastic layered over that purple. This is gorgeous! I just love Hare polishes. I really need to get this one now. This is one of my favorites!!! I love it over the base color you chose! gorgeous!!! love the glitters touch to it! It is a wonderful glitter combination. Plus I love the combination you made with Modern Grace. Me too. I really need to get more!